It’s a simple idea – understanding how people use your store and catering to them will boost sales. What percentage of people abandon their carts? How many folks leave during the checkout process? What are the most popular products that we should feature on the homepage? Analytics tools like Google Analytics and KISSmetrics can help you answer all of these questions, and optimize your site to close more sales. When you’re ready to get more visitors, email and advertising tools like Bronto and Facebook Audiences can help you send personalized communications, drive traffic, and analyze the effectiveness of your campaigns. In the past, ecommerce companies needed to hire developers to install these tools individually. Though each tool is powered by the same information – who is on your site and what are they doing – they each require this information in slightly different formats. Developers used to need to write code to track this same information, in different languages, for each tool, on every page. Oy vey. We’re eliminating this tedious process over here at Segment. We’ve built a single platform to collect all of your data and send it off to any tool you want to try with the flick of a switch. We’ve just announced a new plugin for WooCommerce, too. This means Woo customers can install more than 100 analytics and marketing tools with zero code and zero developer costs. When you turn on the Segment WooThemes plugin, we start tracking important information user actions like viewing items, adding products to carts, and completing orders. Then, we send these analytics events to tools you turn on in our control panel. But how can you use this information to improve your site? What are the best tools to get started? Here’s an overview of different types of tools, the problems they solve, and the most popular services for each category. First things first: analytics tools help you understand how people use your site. How many visitors do you have? What pages are they on? What website is sending you the most traffic? Ecommerce companies often use Google Analytics Ecommerce to answer these questions about how people interact with their online stores. Google Analytics is great for understanding referral traffic, how long people stay on each page, and how people move through the site within a single session. In this example, the overall conversion rate for the website is 4.8 percent. (942 people completed a purchase divided by the 19,829 total that visited the site.) To boost this number, the company could focus on the fact that very few people who visit their site even view a product. Then, they might run an experiment to see if making popular products more prominent in their homepage will increase the percentage of people who view products, and continue on down the funnel. Amplitude, KISSmetrics and Mixpanel are popular tools for funnel analysis. 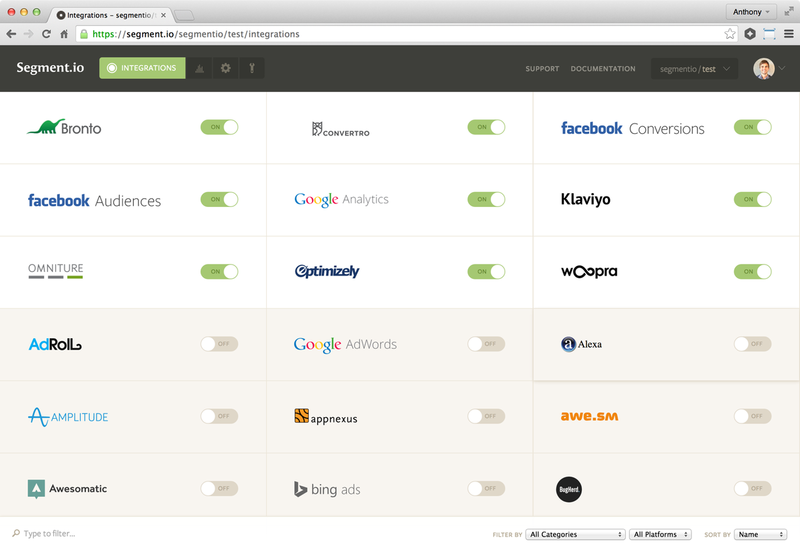 With the Segment WooCommerce plugin, you start using these tools with the flick of a switch. To get an even deeper understanding of where people are looking and clicking on your site, you might want to try out a heat mapping tool. Heat mapping tools show you exactly how people move through your website and where they click, so you can optimize accordingly. Some tools like Inspectlet can play back user sessions as if you were looking over their shoulder and watching their mouse movements. These tools also let you key in on a specific part of that conversion funnel we were talking about and let you see what happened when a user dropped off. More traditional heat mapping tools like CrazyEgg let you visualize where your visitors click and shows important hot spots. These tools are super helpful for detailed analysis, but make sure to remember that people don’t always move their mouse and click where they are looking, so you’ll have to take these with a grain of salt. Like heat mapping tools, a/b testing tools help online stores increase sales. Should our checkout button say “check out now” or just “check out”? Which shopping cart icon converts better? Will more people buy more items if we ask for all of the billing and shipping information on one page instead of breaking it into two? A/b testing tools like Optimizely and Visual Website Optimizer are really powerful because they let you go into your site and change this type of copy and design without touching any code. Then they serve up the different versions you’ve created to different visitors, so you can see what works best. Many of our customers also like to use Tapalytics for a/b testing on mobile devices. If you’d like more tips on how to use a/b testing tools effectively, check out this nifty article on the KISSmetrics blog. Now that you’ve improved your conversion funnel and optimized the copy on your site, it’s time to start sending more people to it! Email marketing is a way to drive visitors to your store. And, new tools have made it super easy to send personalized notes. This is how it works: Segment tracks important user actions on your site like viewing products, adding items to carts, and completing orders. Then we send this data off to your email tool of choice. Now, you can easily set up an automatic email to people who have added an item to their cart, but have not purchased it within five days. What’s also handy is that these tools help you populate the customer’s name and the item they viewed, giving the email a personal touch. Another great thing about setting up your email tools with Segment is that you can gauge how effective they are by setting a “conversion event.” A conversion event tracks if the people you sent the email to actually did what you wanted them to do. For example, you might set the conversion event for an email about abandoned cart items to purchasing those items. Segment and tools like Customer.io, Bronto and Klaviyo make this super easy. Customer.io and Vero are helpful tools for sending these kinds of emails. Bronto and Klaviyo are other popular email tools that target ecommerce sites specifically. They focus on addressing niche ecommerce challenges like shopping cart abandonment and re-engaging customers who’ve already purchased from your site. But you can only reach the people on your email list with email marketing. (Duh!) What about folks who haven’t purchased before, signed up for your newsletter, or logged into your site? How do you get those people to come to your website? Enter: advertising tools. Search advertising is a great way to attract people that have expressed interest in your product, and the most popular tool for search is Google Adwords. With Google Adwords you can buy advertisements to appear when people search a set of keywords. For example, Johnny’s Bikes – a theoretical store located in San Francisco – might want to buy search ads for the phrases “road bike SF,” “bike store SF,” and “bike shop San Francisco.” Google Adwords are particularly helpful for ecommerce sites in niche industries. If you’re in a competitive market like jewelry or clothing, these search phrases will be more expensive. Facebook Ads are also a good tool to start with ecommerce advertising for the simple reason that Facebook has huge audience and a lot of detailed information about their users. This means you can target ads to people based on relevant interests and demographics. For example, Facebook knows that I like ballet and live in San Francisco, so dance companies pay them to serve me me ads for performances around here. A third type of advertising strategy to consider is retargeting. Ad retargeting networks like Perfect Audience keep track of who has visited your store and send can them ads while they are browsing other sites. Retargeting has obvious benefits — you’re reaching out to people that have already expressed interest in your site, so they are probably more likely to buy something. Just be sure to set limits on your campaigns, so you don’t bother people too often. My Dad likes to say, there is always room for improvement, and in the case of ecommerce sites improving your store will also make you more money. Analytics and marketing tools are designed to help you on this journey, and the Segment WooThemes plugin is the easiest way to manage all of these tools. What are you still doing here!? Get started! Donec ullamcorper nulla non metus auctor fringilla. Maecenas faucibus mollis interdum. Duis mollis, est non commodo luctus.